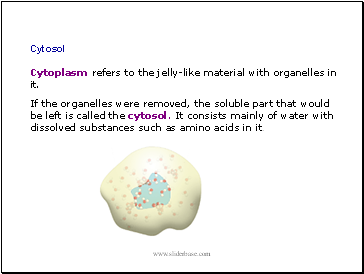 Cytoplasm refers to the jelly-like material with organelles in it. 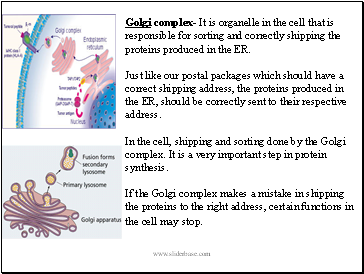 If the organelles were removed, the soluble part that would be left is called the cytosol. It consists mainly of water with dissolved substances such as amino acids in it. 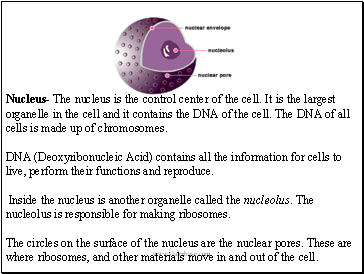 Nucleus- The nucleus is the control center of the cell. 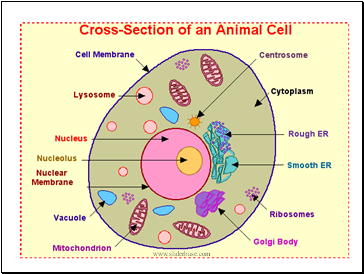 It is the largest organelle in the cell and it contains the DNA of the cell. The DNA of all cells is made up of chromosomes. DNA (Deoxyribonucleic Acid) contains all the information for cells to live, perform their functions and reproduce. 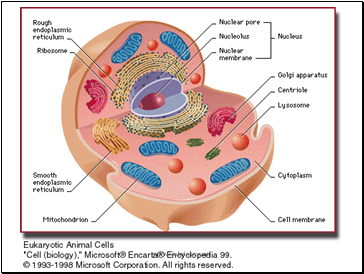 Inside the nucleus is another organelle called the nucleolus. The nucleolus is responsible for making ribosomes. The circles on the surface of the nucleus are the nuclear pores. These are where ribosomes, and other materials move in and out of the cell. 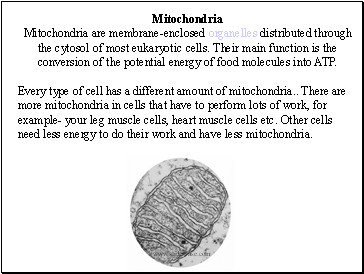 Mitochondria are membrane-enclosed organelles distributed through the cytosol of most eukaryotic cells. Their main function is the conversion of the potential energy of food molecules into ATP. Every type of cell has a different amount of mitochondria There are more mitochondria in cells that have to perform lots of work, for example- your leg muscle cells, heart muscle cells etc. 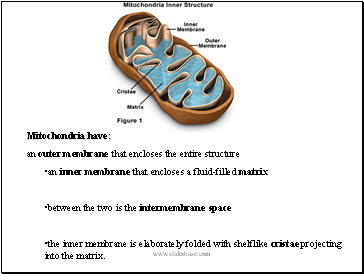 Other cells need less energy to do their work and have less mitochondria. Endoplasmic reticulum (ER)- It is a network of membranes throughout the cytoplasm of the cell. There are two types of ER. When ribosomes are attached it is called rough ER and smooth ER when there are no ribosomes attached. 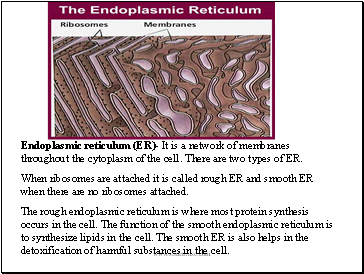 The rough endoplasmic reticulum is where most protein synthesis occurs in the cell. The function of the smooth endoplasmic reticulum is to synthesize lipids in the cell. The smooth ER is also helps in the detoxification of harmful substances in the cell.